New York’s attorney general levied hefty fines against JPMorgan, Barclays, RBS and others. Now he has resigned amid allegations of abuse. It’s no reason for banks to gloat. Any successor will have just as much incentive, and perhaps more credibility, to pursue financial misdeeds. 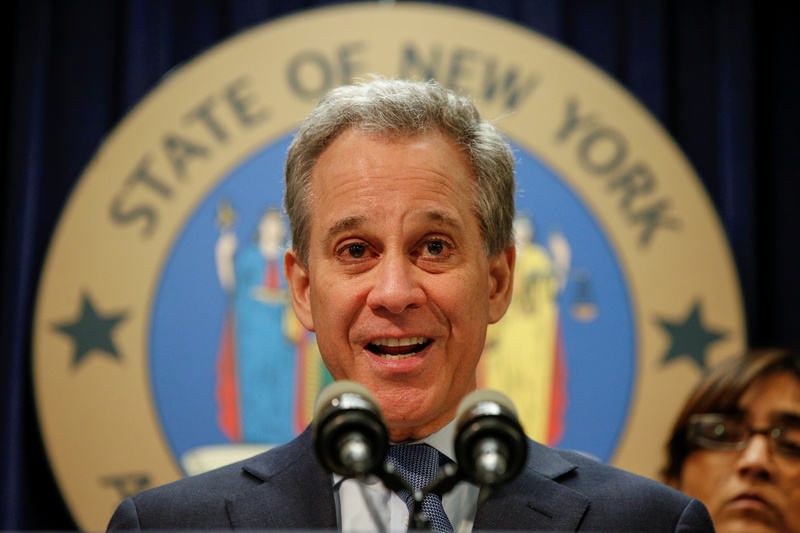 New York Attorney General Eric Schneiderman speaks during a news conference to discuss the civil rights lawsuit filed against The Weinstein Companies and Harvey Weinstein in New York, U.S., February 12, 2018. New York State Attorney General Eric Schneiderman resigned on May 7 after the New Yorker published allegations that he had physically abused four women with whom he had romantic relationships. Schneiderman said in a statement that he had “engaged in role-playing and other consensual sexual activity” but denied the allegations. “I have not assaulted anyone,” he said.